RP: Worst. Escape note. Ever. 6 Responses to RP: Worst. Escape note. Ever. 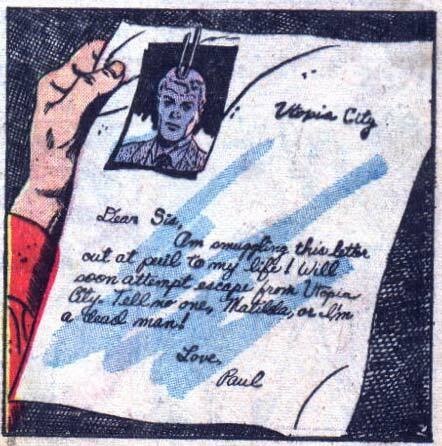 I think my favorite part of this secret escape note — secret because presumably there’s a risk of the guards reading it — is that “Paul” felt the need to not only sign his name and announce his plans, but to affix his picture to it. AND THE NOTE IS TO HIS SISTER!! Maybe he was stuck in Utopia City so long she was at risk of forgetting what he looked like. That WOULD be awkward, trying to rush up to her after a successful escape only to have her slap him and crying for the police because she didn’t recognize him. On a more positive note (get it?! ), this issue is drawn by a youngish John Buscema. Which is cool. He also includes her name on it, meaning if the letter were to be intercepted, he’d be killing her, too. This guy’s a real genius, huh? Willy, yes, that’s obvious. The point is, it doesn’t work as exposition and it doesn’t work as a plot device and aside from all that, it doesn’t work as an escape note! There are lots of ways of advancing the story through a narrative device that doesn’t completely destroy the very plot element that’s supposed to be providing dramatic tension. Come on man, that’s the stupidest escape note you’ve ever seen, and it doesn’t even work on a meta level of “exposition” as you’re arguing. Admit it, it’s ridiculous! I like how he’s so rushed he leaves the “I” off the beginning of his first two sentences, yet he closes with “Love, Paul”.